Nozawa Onsen is one of the Nagano ski resorts, located 46km northeast of the city of Nagano. It takes about 4-5 hours to get from Narita Airport to Nozawa Onsen via train and 5-6 hours by bus. There is a bus that leaves from Narita (Tokyo) Airport each night at 8 pm. It takes 3 hours by train from Tokyo to Nozawa Onsen. 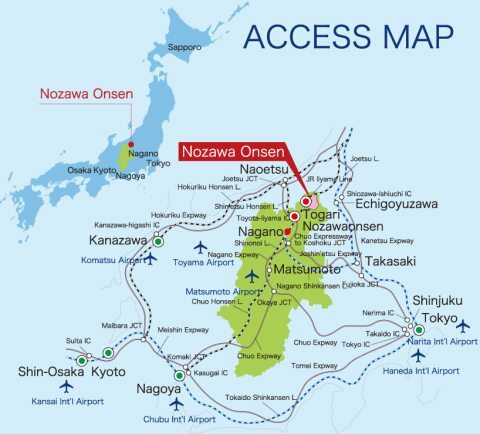 Looking for more ways to get to Nozawa Onsen? Nozawa Onsen is like a true Japanese ski resort Shangri-La. From the mountain peaks on a clear day you can see the sun set into the ocean. The town has some amazing traditional architecture with Temples, Hot Spring Houses, and traditional Inns. Please have a look at the below maps to see the position of Nozawa Onsen in Japan and also the great position of our properties in the Village. Most of our lodges do not have parking however we can usually arrange free parking in the Village for our guests. Just ask when booking and we will organise something for you. We’ve written a few articles on Nozawa Onsen and one of them is about how to come and ski Japan on a budget. Hope you like it!